Lloyd Thaxton: ELVIS IS ALIVE ... ALIVE! In my last posting, I delved into the "Where were you when..." subject; people remembering exactly where they were when a momentous event happened in their lives. The subject of the posting was the assassination of John F. Kennedy on November 22, 1963. If you missed it, scroll down and read it before you tackle this one. There is a tie-in. A few days ago I got an invitation from a long-time friend, television producer and director, Steve Binder. When I was doing The Lloyd Thaxton Show back in the 60s, Steve was directing The Soupy Sales Show. My show was on from 5 to 6 in the afternoon and Soupy's show was on from 5:30 to 6. Needless to say, we were both fighting for the same audience and when Soupy came on at 5:30, he cut into my ratings. I came up with a way of fighting back. I would schedule my biggest name guest artists at 5:25 and carry the segment through to 5:35. I figured that once I lured my audience past the opening of Soupy's show, they would stay with my show. Sneaky? Well, it worked. It was a friendly rivalry and Steve and I would meet now and then at a local watering hole and discuss our day to day careers. It is amazing to me that those conversations all took place over 40 years ago. What has this to do with Elvis? 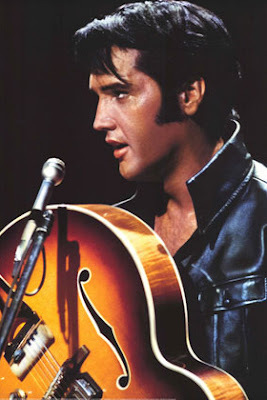 The invitation I got from Steve was to attend the 40th Anniversary showing of The Elvis '68 Comeback Special on March 14th, which Steve had produced and directed for NBC Television. As soon as I read the invitation my mind immediately flashed back to 1956. At the time I hosted a TV show at WSPD-TV in Toledo, Ohio, Leave It To Lloyd. 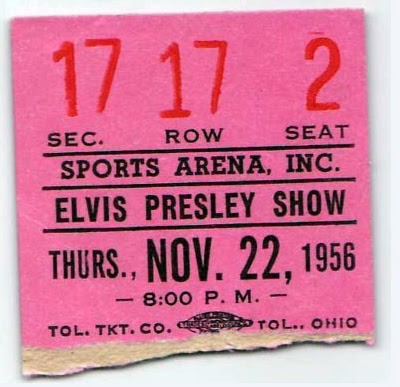 Elvis was scheduled to do a concert at the city's Sports Arena. It was THE momentous event for our city. Where exactly was I on that date? I was on stage introducing ELVIS PRESLEY. Can you ever forget something like that? "Lloyd, what was it like to be chosen the one to introduce the King?" Glad you asked that question, because I have been waiting 52 years to tell you. 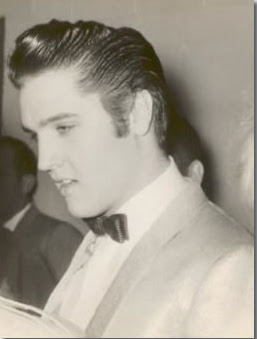 The first thing that happened was meeting Elvis back stage just before he was to go on. The air was filled with electricity. The arena had put up ten foot high partitions around the back stage area to keep the crowds away. While speaking to Elvis, I couldn't help but notice the security guards using their batons to swat the fingers of teen-age girls as they tried to climb over the partitions. You could hear the crowd growing restless in their seats. It was really bazaar; like the sound the wind makes before an approaching tornado. Elvis seem completely oblivious to the situation. He was in his element. The crowd went crazy. I had never heard screams so loud. Over 10,000 girls were screaming at the top of their lungs. It didn't take long for me to figure it out. They did this to EVERYONE who walked out on that stage. They thought (hoped) that it was ELVIS. I stood there soaking it all in and then made my brilliant introduction that absolutely no one ever heard. 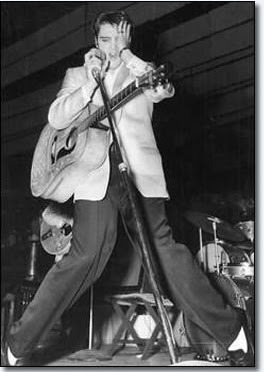 Elvis jumped out on stage, started his act and the screaming continued for the entire two hour show. No fireworks, no dancers, no costume changes, just Elvis and his band. It was absolutely unbelievable. My two young sons, Lee and Robin, were sitting in the audience and told me later how much they HATED it. For two hours they couldn't hear anything but screaming girls (and you know how much young boys love screaming girls). "The screaming youngsters frequently bordered on hysteria," a Blade reporter wrote in the next day's paper. But to a girl, the 10,000 screamers (even the ones with sore fingers), it was the most exciting event of their young lives. And, Toledo had made it to the big time. As for me , I not only remember the exact date, I remember exactly where I was standing; next to the KING. It was November 22, 1956, exactly seven years, to the day, before that other "where were you" date, November 22, 1963. It's funny but this is the effect that Barack Obama has at apearences. I bet noone would ever see that coming in the Eisenhower era. I am convinced that Presley did not "die" in 1977, but was put into the federal witmess protection program. Is he STILL alive? Possibly. But Presley took himself OUT OF the public eye in 1977 for most likely personal safety reasons. Too much "evidence" has convinced me of that conclusion. PS...WHEN can we buy some uncut Lloyd Thaxton shows on DVD/VHS thru Lloyd?? I'd even buy his 1977"revival" show, too!